Rotary Club of Leigh - Welcome! Our club was formed in 1931 and has a modern and progressive membership of pro-active individuals who work together for the good of others through numerous initiatives and fund raising projects. This takes the Rotary motto of "Service Beyond Self" to a level that really makes a difference. We support a wide range of projects within our local community, as well as International Projects and Disaster Relief. We have a meeting every Monday to enjoy each other's company, listen to inspiring speakers, and keep up-to-date with our community and projects. We also meet for various other Social, Fund Raising and Community Service events. If you would like to attend one of our meetings to find out more about what we do, please use the “Contact” facility at the top of this page, or use the links to find more general information about the world-wide Rotary organisation. We meet at Monday Lunchtime at 12.45 pm. Come and enjoy a night of fine music and hilarity as Bram and guests entertain us with a wide range of ballads and folk music, interspersed with amusing tales. Bram Taylor is a local lad who has gained a well-deserved international reputation after enthralling fans with his fine baritone voice in Europe,the USA and Canada where he appeared alongside Don McLean, Gordon Lightfoot, The Proclaimers and Buffy-Sainte Marie. He will be joined by two excellent musicians – Dave Howard from the Oldham Tinkers and BBC TV studio director Nick Peake. 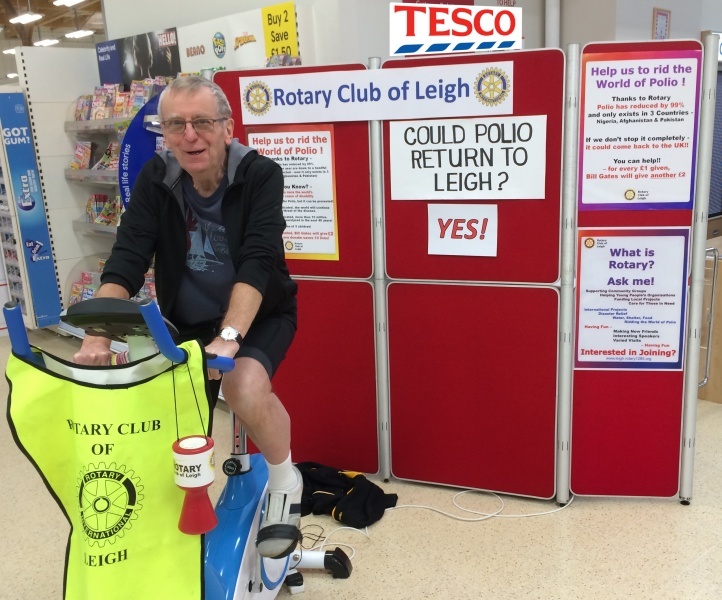 Rotary’s International campaign to rid the world of the dreaded Polio disease benefited from the collection held at TESCO Leigh on Saturday 16th April. Six cyclists pedaled all day to attract attention and the generous customers donated £372, which will be increased to £1072 by the Bill & Melinda Gates Foundation, who are backing the Rotary “End Polio Now” campaign. Since this was started in 1985, the 125 countries which had Polio cases is now down to just 2 countries – Afghanistan with 21 cases in 2018 and Pakistan with just 12. Our thanks are extended to Tesco for enabling us to make this collection and the cyclists who helped on the day – and, of course, the generous customers. Together we can defeat Polio – we are getting close! Santa Claus has taken time from his busy day to write a letter to say to everyone from Leigh and Lowton, a very big “Thank You” for kindly donating an amazing amount of over £15000 to Leigh Rotary Club’s charity fund raising. Leigh Rotary’s President Frank Bowker said, ”The pleasure on children’s faces during our collections made all our efforts really worthwhile. Touring the streets with the Santa Sleigh brought so much joy to children and their parents. “The amount raised was tremendous and set a new record - what amazing people we have in our town! The funds we collected will be put to good use for worthwhile causes such as youth groups, community organisations and other deserving causes. Above: Santa with some of the thousands of children who came out to see him. Santa Claus managed to get away from his busy day of present making, to call in at a children’s party to personally hand out his gifts. Children from various areas around Leigh were treated to a Christmas party by the Rotary Club of Leigh and were enjoying fun and games when Santa arrived. The 45 youngsters had spent the afternoon dancing, eating and playing games and were delighted to receive presents from a very jolly Father Christmas. Later they were treated to a meal then received some presents to take home. The Rotary Club are grateful to the directors of the Masonic Hall for their kindness in allowing use of their facilities and to caterer ‘Marks with Splendour’ for providing the food. The first of July is the beginning of the year for Rotary Clubs throughout the world and the Rotary Club of Leigh welcomed their new President, Frank Bowker, with Alan Smallshaw becoming Vice-President. The Rotary Club of Leigh is always happy to hear from any groups in the area who have a project that we may be able to support. We would also like to hear from anyone interested in joining Rotary or in helping with any of our events. What a great time everyone had at Leigh Rotary’s Hog Roast - a beautiful summers day and a fantastic location at Rob & Jeanette Dyson’s garden made it a memorable occasion. The event started with visitors watching England beat Sweden 2-0, followed by roasted hog served on barm cakes and finishing with apple pie. Everyone was well entertained by members of the Wigan Ukulele Club and the tombola stall was a big success. The event was used to raise funds for Willow Young People’s Counselling Service, who supports vulnerable young people in Leigh and district that have various emotional needs, by giving one to one counselling. Even established professionals can find that speaking in public can be a nerve-wracking experience, but when you are under 12 years old, speaking to an audience of seventy people becomes a massive challenge! That is what youngsters had to face at Leigh Rotary Club’s “Let the Children Speak” event. Pupils from eight local schools took part with 20 pupils speaking for 5 minutes on a very wide variety of topics of their own choice, ranging from “Endangered Animals” and “How to Look After Dogs”, to “Animation” and “Football”. Rugby League personality and Rotary member John Stringer acted as MC and Rotary President Brian Mills summed up the event, saying, “The youngsters were amazing - speaking clearly and with confidence on interesting subjects and this will really benefit them in their future schooling, careers and personal life. Parents and teachers must be very proud of the youngsters achievements.” Thanks were extended to Sheenagh Newton, Head of XII Apostles, for organising the participating schools and to the Directors of the Leigh Masonic Hall for allowing the use of their facilities. Each child was presented with a commemorative trophy. Schools that entered speakers were Newton West Park, Westleigh Methodists, Leigh C of E, Bickershaw, Sacred Heart, Leigh St Gabriels, St Josephs and XII Apostles. A group of 21 Members and ladies enjoyed a lovely lunch at Alberts (on the East Lancs Rd) before we moved on to the BBC Studios for a most enlightening tour. First we assembled in the “Green Room” then saw the radio presenter’s studio, with hundreds of knobs and dials to play with, whilst on the other side of the glass screen, radio presenters Mark Radcliffe and Stuart Maconie were broadcasting their live programme. After visiting the main studio for A Question of Sport and other sports programmes, we passed through the main hall, where we caught a glimpse of various broadcasters including Dave Guest, Kevin Fitzpatrick, Roger Johnson and Annabel Tiffin. What a wonderful day and a great social time together. We also rescued a very rare species from a pond – a Morrison’s Trolley! Following our expedition, 11 of us enjoyed lunch and the odd beer at the Robin Hood. Thanks to the Leigh Ornithological Society for making the day so enjoyable. We were very pleased to have 2 new members join Leigh Rotary Club in March. We got to know Pete Nugent when he helped us with the Santa Collection and the Crocus planting. He enjoyed our trip to the Fire Station recalling his life as a Firefighter in London, commuting weekly from his home in Pennington, where he lives with his wife Jen. Mike Norris joined at the end of March having attended several meetings after giving us valuable help by towing the Santa Float with his 4x4 vehicle. Mike lives with his wife Roberta near Gilded Hollins and has an interesting hobby with his rather large model trains. Leigh Rotary members have had a busy time gardening over the last few months. In April we obtained 105 tree saplings for Rotary’s project to plant 35000 trees - one for every Rotarian in the UK. The saplings were obtained free of charge from the Woodland Trust and were planted in Lilford Park, in co-operation with the Leigh Ornithological Society. The local “Green Team” joined in to plant some trees and “Friends of Lilford Park” surprised us by barbecuing sausages and treating the volunteer planters to hot dogs and drinks. The following photos show the volunteers ready for action. Last October, Leigh Rotarians planted purple crocuses in support of Rotary International’s “End Polio Now” campaign to rid the world of the terrible Polio disease. Rotary has helped to immunise over 2.5 Billion children since 1985 and we are now very close to eradicating this disease. We would like to thank everyone who assisted or attended our race night, it raised £1100 for charity. Another event at Tesco Leigh – our Bike Ride for Rotary International’s “End Polio Now” campaign took place on Saturday 24th February, with cyclists from the club including Dave Jones, Stuart Forshaw, Alan Smallshaw & John Bullough all breaking into a sweat! We were well supported with other cyclists from the Rugby Union club and member’s friends. The collection raised £338 and Microsoft founder Bill Gates will add a twice that amount to make it up to £1014. This will be used to immunize children in Afghanistan & Pakistan, which are the 2 remaining countries in the world where this disease has still not been eradicated. Polio is a crippling and potentially fatal infectious disease, which Rotary has been working hard to eradicate globally since 1985 when there were 125 polio endemic countries. Rotary has helped to immunise over 2.5 billion children globally since then and Polio cases across the world have reduced by 99.9% from 350,000 cases in 1988 to just 17 in 2017. No cases have been reported yet in 2018, but it only takes one infected person to jump on a flight to the UK, to bring this terrible disease back to the UK. That’s why Rotarians, governments, non-governmental organisations and the public are working together to raise the additional £1 billion needed to eradicate polio for good. Together we can beat polio. An initiative by Rotary Clubs in the “Wigan 7” area has been declared a roaring success! Many people have been astonished that they have not been able to return Hospital Equipment after they have finished using it, even when it still looks brand new. That has recently changed as Wigan Council now has a department that can clean, repair and refurbish Crutches, Zimmer Frames, Perching Stools, Commodes, and Wheelchairs etc. The problem is that facilities didn’t exist for collecting such equipment, which has accumulated in people’s houses over many years, so local Rotary Clubs stepped in to organise a collection of surplus equipment on Sunday, 18th February. In a co-ordinated effort, similar collections were made by the Rotary Clubs of Tyldesley and Atherton, Astley, Wigan and Ashton-in-Makerfield. At Monday’s meeting on 8th January, we had the pleasure of introducing Geoff Melling as a new member. Geoff has attended lots of recent meetings and other events and has helped out at the Santa collections. His membership will be an asset to the club. The photo shows Geoff with his sponsor, Chris Stephenson and Club President, Brian Mills. Father Christmas has sent a letter to say a massive “Thank You” to everyone from Leigh and Lowton who kindly donated an amazing amount of just over £14000 to Leigh Rotary Club’s charity fund raising. Leigh Rotary’s President Brian Mills said, ” I cannot describe the amount of pleasure seen on the children’s faces, (and their mums and dads) during our collections and this alone made the effort really worthwhile. The Rotary Club of Leigh held their annual Charity Christmas Concert at Leigh Parish Church on 9th December, with a full church being entertained by the Wigan Youth Brass Band & Wigan Youth Choir. Their programme included a wide range of tunes and songs, ranging from Slade’s Merry Christmas Everybody, to a James Bond Medley, interspersed with traditional Carols, which the audience sang with gusto. The youngsters further demonstrated their musical talents with some test pieces and finished with the Snow Waltz, “Schneewaltzer”, with the audience and the band bobbing up and down to the Austrian melody. The concert was attended by the Mayor and Mayoress, Bill Clarke and his wife Joan, along with Leigh MP Jo Platt. They remarked on the amount of young musical talent we have in the area and praised the band and choir for their wonderful performance.